Based on the headline, you may be thinking—great, another "millennials in the workplace" article. Since millennials are the largest share of the American workforce, it is no coincidence that they generate considerable attention. But the conversations around the topic of millennials often emphasize generational differences that do not exist. The truth is that what motivates your employees at work has nothing to do with their generation. Before you dispute that argument, however, it is important to define what generations are. Generations refer to cohorts of people based on shared experiences at similar ages. The assumption is that shared experiences at similar ages create similarities among people in terms of personal attributes, attitudes, personalities, political orientations and other dispositions, such as work-related attitudes and behaviors. These stereotypes, which are fueled by pop psychology, have shaped the perceptions that this generation is upending the workplace, among many other areas. Qualtrics research, for example, suggests that the drivers of engagement are not very different across generations. Similar to the academic research that is referenced here, Qualtrics found that the differences that do (or appear to) exist between generations are more attributable to factors such as age, tenure, and the point at which an employee finds himself in his career or personal life. For example, you can attribute generational differences to factors such as childcare stages, more dual-career families, retirement preparation, and years of experience in the workplace, among others. 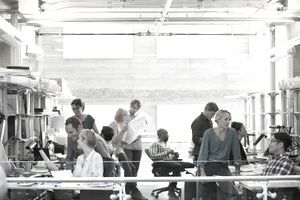 Moreover, the workplace trends often attributed to generational differences (especially millennials) are often more ubiquitous trends that can impact employees across generations, ages, job levels, and so forth. For example, your employees’ expectations of what work should be, what they get personally from work are shifting. Employees have better access to information about other jobs and organizations. These trends have an impact on the entire workforce, not just members of some generations. To provide greater context, it’s helpful to examine some examples of work-related attitudes and behaviors where millennials stray and tow the line, drawing from experts as well as The Millennial Study, a research initiative Qualtrics completed in partnership with Accel that surveyed over 6,000 millennials, Gen Xers, and baby boomers. Qualtrics found that 82 percent of millennials say that their job is an important part of their life—a rate higher than that of older generations. But how do you reconcile that given that millennials switch jobs every 26 months? Generational differences aren’t necessarily the culprit; often it is a case of tenure or other related variables. Costanza and Finkelstein confirm this in their article. “Older employees may be more likely to show higher organizational commitment than younger employees may be, but this is not because they are boomers instead of millennials. Rather, any differences may be because older workers have more invested in their job, organization, and career than do individuals just starting out in the work world. "This is also not to say that a particular younger person will not be committed to their organization simply because they are young.” In other words, this professional nomad attitude among millennials is a product of entering the workforce—not a generational byproduct. Qualtrics' research revealed that half of the millennials question their capacity for success, making them two times more worried about their skill set than older generations. Conventional wisdom would hone in on the stereotypes—millennials are the anxious generation. But a more nuanced analysis suggests that some of this anxiety about having the right skills to succeed may just be because millennials are under pressure to make a good first impression as the new person in the office. Additionally, technology and globalization are constantly changing the scene, giving every generation reason to be concerned about staying with the pack. When taken to its logical extreme, applying generational tags to employees is extremely dangerous. Generations are one of the broadest categories into which you can bucket employees. The notion of adjusting hiring, performance management, and pay practices, for example, to groups of people based on the year that they were born is fundamentally the same as doing so based on gender or race/ethnicity, which most (if not all) of us can agree is absurd and unethical. Ultimately, there are many factors that are far more important (and well supported) in predicting workplace attitudes like engagement and workplace behaviors like performance and retention than the generational differences of the employees. Instead of relying on unsupported stereotypes and erroneously attributing workplace trends to a generation, you should focus on what matters to individual employees. You’ll be much better off focusing on your employees as unique individuals rather than lumping them into large and meaningless meta-groups. Consultants, who work in the fields of management and HR, are frequently asked, “What do millennials want at work?” The best answer comes directly from the title of Bruce Pfau’s "Harvard Business Review" article: "The same things the rest of us do." Benjamin Granger, Ph.D.
Want 10 Tips on How an HR Manager Can Influence Business Strategy? Are You the Employee Coworkers Identify as Negative? What Happens When an Organization Successfully Integrates Changes? Does Your Corporate Culture Support the Values and Behaviors You Need? Are Your Employees Ready to Commit to Change? What Stages Do Organizations Experience in Managing Change? Want to Know the 5 Causes of Employee Negativity?